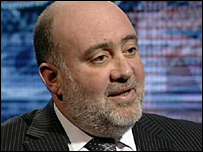 In a HARDtalk interview broadcast on 7 January, Stephen Sackur speaks to the Israeli ambassador to the UK, Ron Prosor. Israel's Operation Cast Lead in Gaza was carefully planned - not just the military assault but also the diplomatic offensive. Ron Prosor, Israel's ambassador in London, is one of those fighting the information war. Israel he says, is doing what any state would do: protecting itself against terrorism. But with the civilian death toll rising and a humanitarian crisis deepening, is Israel's strategy working? Ambassador Ron Prosor talks to Stephen Sackur. HARDtalk is broadcast on the BBC World News channel Monday to Thursday at the following times (all GMT): 0430, 0930, 1430, 1830 , 2130 and 2330 (please note regional times may vary). HARDtalk is also broadcast on the BBC News Channel Mondays, Tuesdays and Wednesdays at 0430 and 2330.